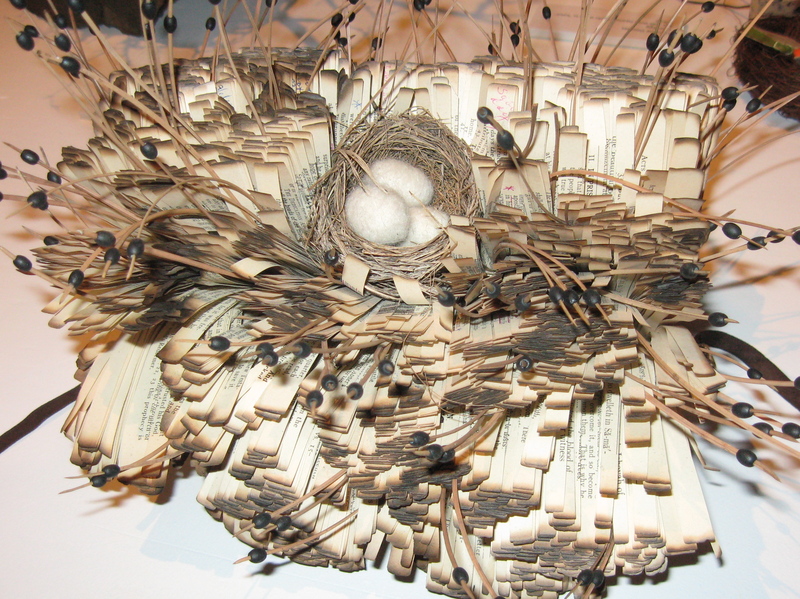 This entry was posted in Art, Books and tagged Agatha Doerksen, Bound by Nature, Carol Leach, Deborah Danelley, future of the book, Mennonite Heritage Centre Gallery by doradueck. Bookmark the permalink. Thanks, Dora, for another thought-provoking post; this time on Friday night’s “Bound by Nature” exhibit which also struck a deep chord within me! And it was a special treat to see you there too so we could “talk books” (including your’s!) for a while as we stood on the balcony and looked down on that rich & inspiring array of “book nests” below us! I too especially loved the intricate beauty of Agatha’s “nests as destiny,” the essence of which you caught so well in your photograph. And I was struck also by the delicate texture of the pastel eggs held so lovingly within their environmentally-friendly nests of printed pages awaiting new birth (perhaps of the Word in another form?) – One could almost feel the nurturing hands which so gently fashioned and placed them there. 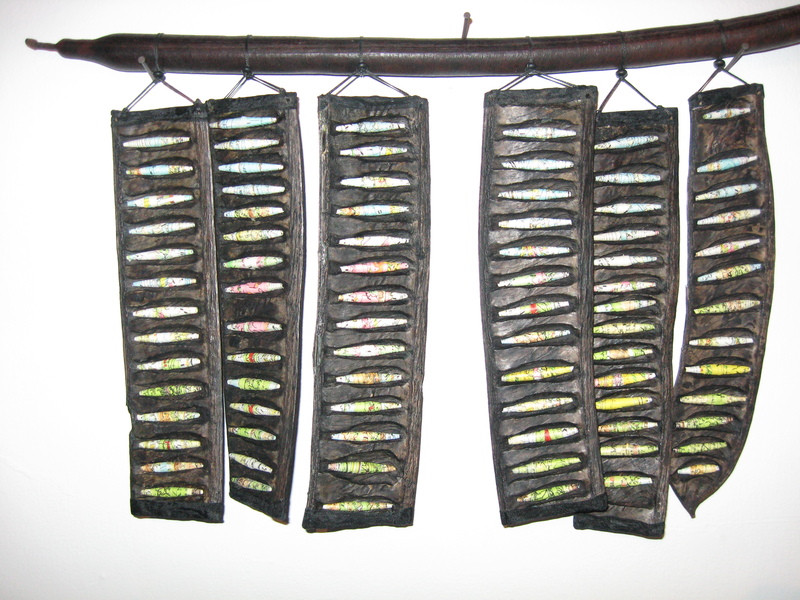 At the same time, I also appreciated the earthy impact of the “book nests” of another friend, Karen Clavelle, whose creativity, in some of her pieces, seemed to draw on the origins/chaos of creation, with skulls and bones and teeth and rocks and shells giving rough homes/resting places for tiny books like butterflies which rested lightly upon them ready to take off into a newly emerging world; and in another evocative piece, small translucent scrolls bearing the name of writers, past and present, nestled within the crags and crevices. Oh my, Leona, once again you have so wonderfully added to — enhanced and enlarged — this post! I appreciate your review of Karen Clavelle’s work. Thanks so much for your observations and the Akerman quote. — I sometimes find myself hesitant to talk about visual art because I feel I don’t have the language for it (much as some high schoolers complain about needing to analyze poetry, for example, because they’re just not sure enough of what they’re supposed to “get”) but it’s always fun to jump in anyway, and when I do, I find a kind of alchemy happening too between what I see and the work I do in my (our) particular medium. Anyway, I’m glad you joined me in that. dear Dora… of course good news or in this case a review, always travels fast, and your lovely and thoughtful comments on the opening of Bound By Nature quickly got to me through various channels. Thank you so much for taking the time to share your insights. I also read your note to Leona which said that you are sometimes hesitant to talk about visual art… I feel the same way about writing … i never quite have the same natural ability to express myself in that way as I do in my art practice. For me your “language” was real, and I am aboslutely thrilled that this exhibition has made you feel optimistic about the future of books in one way or another!! !